Mrs Bishop's Bakes and Banter: A Picnic in Rushmere Country Park with my Gorgeous Blogging Friends! A Picnic in Rushmere Country Park with my Gorgeous Blogging Friends! I am feeling stupidly happy/lucky/smug right now after spending a truly beautiful day with marvellous friends. Today we headed to the amazingly beautiful Rushmere Country Park in Heath & Reach (only 30 minutes from us here in Bedford) to meet up with some of my blogging friends from around the country and their wonderful children. My lovely twin sister Jojo is currently visiting us, so she got to come along today and I was excited to finally introduce her to the friends she's heard so much about. It was a true British picnic. As well as packing the usual sandwich/crisps/pork pie/fruit combo I also packed waterproofs, an umbrella, a flask of hot tea (with bone china mugs, you know me! ), a packet of biscuits (naturally) some of my home-baked blondies for the grown ups, as well as the fruits of Bert's first foray into baking - his Peppa Pig cup cakes to share with his friends. Luckily the rain held off while we ate and Bert got to have a good run around with his friends...I loved watching him having fun, running in and out of trees, and looking at the 'big boys' in awe of their tree-climbing abilities! I captured our day on camera, and couldn't wait to share the photos on here with you... a happy, happy day! Cuddles on the picnic blanket! The picture above is me with my beautiful friend Donna's gorgeous daughter. She's such a beautiful and fun little girl and we had loads of fun playing together today. Donna is a great friend of mine who blogs over at What the Redhead Said... I love spending time with her and both of her wonderful children! Quite possibly the funniest picture of Bert and I ever?! Fairy houses hidden amongst the trees, amazing! After previously thinking she wouldn't be able to make it, my beautiful blogging bestie Emma (from Life According to Mrs Shilts) managed to come along with her gorgeous little boy - what an awesome surprise! Emma lives in the West Midlands and so we don't get to see nearly as much of each other as we'd like. We try hard to get together as much as possible, but as busy working mums and with my lack of driving ability (one of the only times it truly annoys me that I don't drive) it's not always easy to make the journey to see each other. It was fab to spend the day together and Bert loved seeing her little boy, his little partner in crime! It occurred to me while watching Bert play amongst his friends today just how much he's grown...my baby is not so baby anymore. He seemed so grown up running around with the big kids! And of course Bert expanded his ever growing stick collection. What is it about toddlers and their love of sticks? Another of my lovely blogging buddies Kara came along today with her beautiful family. Kara blogs at Innocent Charms Chats, if you don't already know her blog then go check it out! I had only previously met one of her three fab children, and so I was excited to meet them all today as well as her lovely hubby Ashley! After two hours of exploring the woods we headed to the park cafe to dry off and warm up with a cuppa and something sweet. With heavy hearts we said our farewells and headed home covered in dirt and with the good old British rain dripping from our noses! 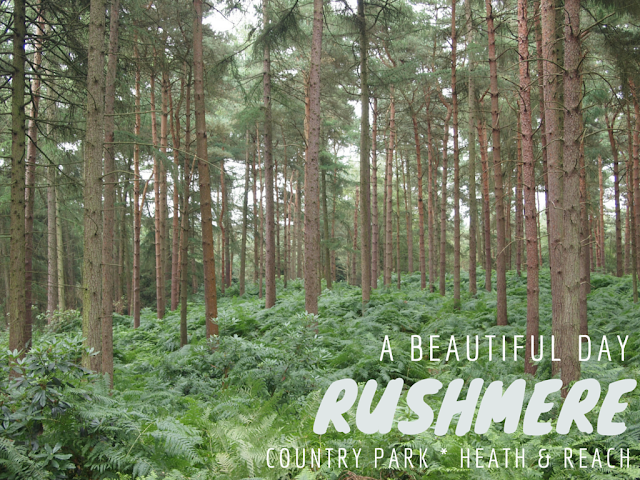 For anybody local to Bedfordshire I would really recommend a visit to Rushmere Country Park - it was our first visit, but will definitely not be our last - we loved it! A big thank you to Hayley over at Shutterflies for organising today's meet up - I'm so glad I came along, and feel so lucky to have spent such quality time with my wonderful blogging friends and their families. If anyone ever asks me why I blog, then this brilliant bunch of women provide the perfect reason - who wouldn't want to be a part of this fabulous nurturing and supportive online (and real life) community? Fab pics. Can't believe you had bone china mugs! It was a really lovely day despite the final burst of rain, nice to do something chilled out with the children there too.